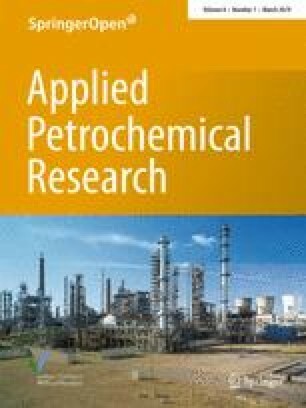 Oligomerization of isobutene to produce high-quality fuel distillates in the range of gasoline, jet fuel and diesel free of sulfur, nitrogen and aromatic hydrocarbons has been investigated over a new environmental-friendly, clean and long-lifetime supported phosphoric acid on H-Zeolite-Y catalyst with SiO2/Al2O3 mol ratio of 60. The catalyst was obtained by acid impregnation and ultrasonic vibration technique with successive heating at different temperatures and under atmospheric pressure. The catalysts were characterized by several techniques (BET, SEM, XRD, TDA, TGA and XPS). The oligomerization reactions were carried out in a gas phase using fixed-bed flow reactor at variable temperature ranges between 50 and 100 °C under atmospheric pressure with a space velocity (WHSV) of 176 h−1.The fuel distillates were identified by GC/MS and quantified by gas chromatography. The results showed that the conversion of isobutene into distillates ranges between 97 and 100%. The maximum selectivity to C 8 = isomers is about 65%, and a flow rate of isobutene 5.0 ml/min. and temperature 50 °C were obtained. Research octane number under the above-mentioned conditions ranges between 85 and 96, and Reid pressure ranges between 27 and 125 Pa.
Alkylates containing C8 fractions or higher hydrocarbons are usually produced from the alkylation of isobutane with olefin, processed in the presence of concentrated sulfuric acid or hydrogen fluoride, which is used as a liquid catalyst. The demand for branched C8 fractions (isomers) has increased sharply due to their use as prime solvents and additives to gasoline. The present alkylation process suffers from inherent drawbacks such as corrosion, toxicity and environmental problems. Therefore, the oligomerization of light olefins might be an attractive alternative to produce liquid hydrocarbon alkylates as components of gasoline and high-value petrochemical products. In addition, in view of the growing concern about environmental pollution, and due to US and European legislation, fuel reformulation is now carried out around the world, focusing on reducing evaporative emissions, lowering sulfur content and aromatics and on complete fuel combustion. In this context, an interesting route for the production of environmentally friendly fuel is the dimerization, trimerization, tetramerization or oligomerization of light olefins . This process is particularly attractive, since the olefin C4 fractions of the FCC process can be used as a feed, with isobutene, 1-butene and 2-butenes as the main components of this fraction. When the olefin source is isobutene, highly substituted C8 olefins are obtained [2, 3, 4, 5, 6, 7, 8, 9]. A number of catalysts have been used in the dimerization and oligomerization of olefins [10, 11, 12, 13, 14, 15]. Phosphoric acid catalysis for light olefin oligomerization and alkylation has been around since the early 1930s in various forms: liquid-phase acid , phosphoric acid supported on quartz  and solid phosphoric acid [18, 19, 20]. The term “supported liquid-phase catalyst” has also been used to describe solid phosphoric acid . In a more recent work, supported ionic liquid-phase (SILP) catalyst was used to produce isoolefin which can be used as a fuel blending . The oligomerization process using phosphoric acid on a silica support as a catalyst has been used for several years to produce gasoline . The reaction is carried out at temperatures over 200 °C, and products range from the dimer (C8) to higher polymeric olefins (C16) [24, 25]. More recent work  showed higher conversion of olefins to fuel distillates, up to 99%. The trimer products of isobutene oligomerization are also of interest, due to the industrial use of triisobutylene as an additive for gas oil [27, 28, 29]. The scientific interest and commercial importance of the oligomerization of butenes has led to the search for new solid catalytic materials that can avoid the formation of higher molecular weight olefins due to their controlled acidity. Among the catalysts reported for this reaction, other than phosphoric acid over silica, are Ziegler–Natta-based catalysts , zeolites [31, 32, 33, 34, 35, 36, 37, 38, 39, 40, 41], sulfated zirconia [42, 43], sulfonic resins , benzyl sulfonic acid on silica , mica montmorillonite , titanium oxide , nickel (II)-exchanged amorphous silica-alumina catalysts , zirconium oxide [49, 50], cationic resins [51, 52, 53, 54, 55, 56] and SiO2-Al2O3 [57, 58, 59]. In addition, modification of the above-mentioned oxides with sulfates, tungstates or phosphates has been widely investigated by several authors in order to modify the acidic properties and stabilize the support [47, 49, 60]. A small selection of patents is included in references [61, 62, 63, 64, 65, 66, 67]. The oligomerization of isobutene over resin catalysts is a well-known reaction and was studied by Haag nearly 40 years ago .The reaction was also studied over cationic ion-exchange resin, Amberlyst-15, by Ramo et al. .
Olefin oligomerization is a reaction for which the activity and selectivity strongly depend on the catalyst, support and operating conditions such as temperature, pressure and weight hourly space velocity (WHSV). The light olefin oligomerization route, catalyzed by acid sites, is a promising way to obtain a premium-quality fuel, free of sulfur, nitrogen and aromatic compounds. Usually, the oligomerization of olefins to obtain fuels is carried out in liquid phase, using phosphoric acid impregnated in a solid support or ionic exchange, with resins as catalysts, which presents important disposal problems or strong deactivation, respectively [70, 71]. Although preferential oligomerization of isobutene has been commercialized by using SiO2-Al2O3 catalysts, low selectivity remains a serious problem with the use of these catalysts . In addition, the lower catalytic activity of existing SiO2–Al2O3 catalysts is another problem. Therefore, new catalysts with high activity and selectivity for the oligomerization of isobutene for high conversion and high selectivity into fuel distillates are needed. This paper is about the development of a new supported phosphoric acid on H-Zeolite-Y for the oligomerization (dimerization, trimerization and/or tetramerization) of isobutene. 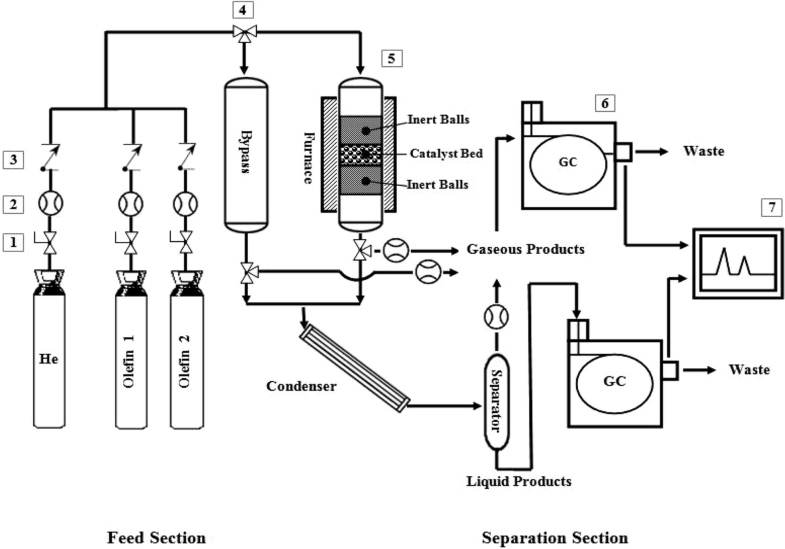 The paper also discusses the production of distillates in the range of clean fuel such as gasoline, jet fuel and diesel, free of sulfur, nitrogen and aromatic compounds, by using the above type of catalyst and oligomerization reactions. H-Zeolite-Y powder support with SiO2/Al2O3, mole ratio of 60, was a commercially available sample from Zeolyst International. 1,1,2-Trifluorochloroethane (BDH) and phosphoric acid (Fluka Chemical d = 1.696) were used without further purification. 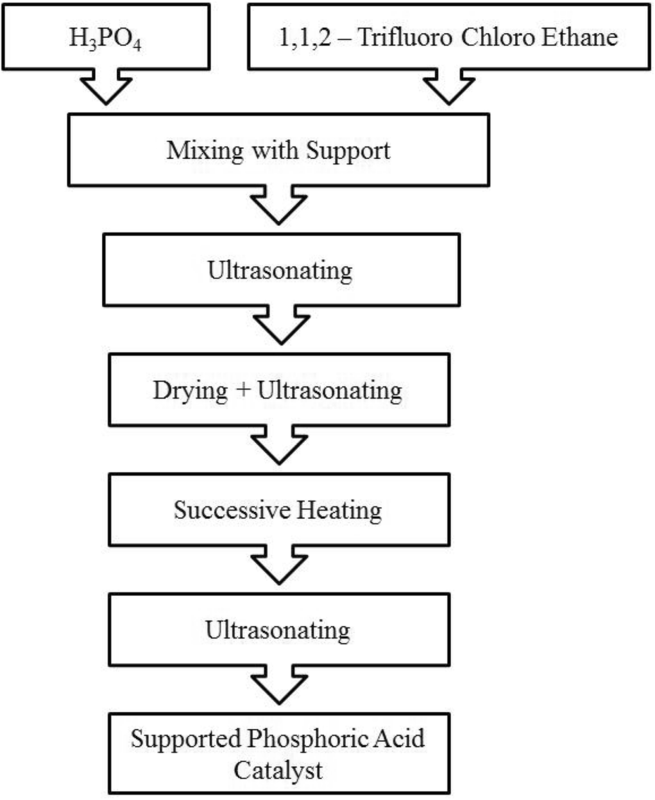 The supported phosphoric acid on H-Zeolite-Y was prepared for the oligomerization of isobutene by acid impregnation and ultrasonic vibration technique as shown in Fig. 1. Solution (A): 4.9 g (50 mmol) of phosphoric acid was dissolved at room temperature in 40 ml of 1,1,2-trifluorochloroethane. The solution was stirred at room temperature for 30 min and then at 35 °C for 2 h until a clear solution was obtained. The resulting solution was then ultrasonated for 60 min. The ultrasonated mixture of (1) was added to 12.5 g of zeolite as support. The resultant mixture was stirred for 60 min and ultrasonated for 12 h at temperatures of 30–40 °C until a homogeneous mixture was obtained. The resulting mixture from (2) was heated under vacuum at a temperature of 40 °C to remove the solvent. The supported phosphoric acid was then transferred to an autoclave under dry nitrogen. The latter was sealed and placed in a vacuum oven overnight at a temperature of 150 °C. The produced supported catalyst was then ultrasonated under dry conditions for 3 h and was then characterized with the following instruments. Powder X-ray diffraction patterns (XRD) were obtained from a Bruker D8 Advance diffractometer, using Cu Kα radiation with X-ray gun operated at 40 kV and 30 mA, using a scan rate of 4°/min (2θ). Scanning electron microscope (SEM) The crystal size and morphology of microscale supported phosphoric acid on H-ZSM-Y zeolite were determined with a FEI–NNL200 scanning electron microscope (SEM). The silicon, phosphorous, oxygen and aluminum contents of the supported and unsupported H-ZSM-Y zeolite were obtained using EDAX Ametek, Model 60040, 10 kV. X-ray photoelectron spectroscopy (XPS) studies were recorded on a JEOL JPS 9010 MC photoelectron spectrometer using MgKα (1253.6 eV) radiation from an X-ray source operating at 10 kV and 20 mA. The measurements were performed at room temperature, and the working pressure was lower than 35 × 10-7 pa. Surface area, pore volume and pore size measurement studies were carried out using a Micromeritics ASAP 2010 system. Differential thermal analysis (DTA) was recorded on a Perkin Elmer (DTA-7) with a heating rate of 5 °C/min, using thermal analysis controller TAC-7/DX. The catalytic behavior of supported phosphoric acid on H-Zeolite-Y zeolite catalyst for the oligomerization of isobutene was studied in a conventional fixed-bed down-flow stainless steel reactor with an internal diameter of 5 mm and length of 35 cm, under atmospheric pressure and at temperatures ranging between 50 and 100 °C, as shown in Fig. 2. The reactor was coupled with a mass flow meter to measure unreacted isobutene. The reactor was heated in an electrical furnace, and the reactor’s temperature was measured by a thermocouple located inside the furnace and was controlled by a temperature controller (Cole Parmer Digi-sense). One gram of catalyst was loaded into the middle of the reactor. The feedstock of the oligomerization reaction consisting of isobutene or a mixture of isobutene with helium gas was introduced at the top of the reactor. Normally, the flow rate of isobutene is 5–20 ml/min under atmospheric pressure. The flow rate of isobutene was adjusted through a separate thermal mass flow controller (Bronkhorst). 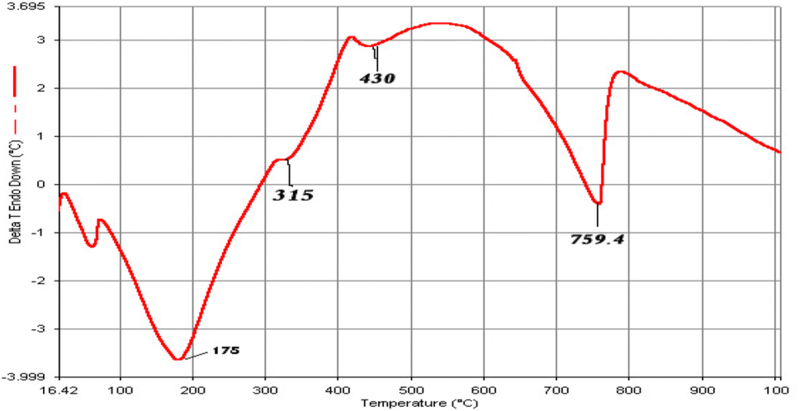 The oligomerization reaction products were collected in a cooled condenser attached to the end of the reactor and were analyzed using a gas chromatograph. Blank reactor runs were conducted and no significant conversions were observed under the conditions of the oligomerization reaction. 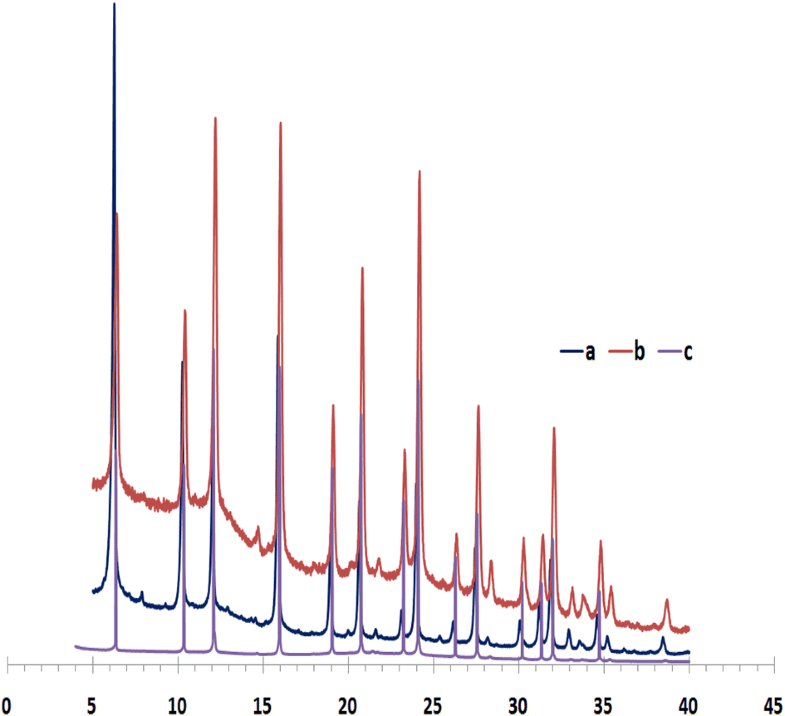 Gas chromatographic analysis of the alkylation products was performed on a Varian 3800 series instrument fitted with a flame ionization detector. The column was 100 m × 0.25 mm glass open tubular capillary PONA column. Identification of the oligomerization reaction products was performed on Shimadzu GC/MS–QP2010. The GC was fitted with a PONA 100 m glass open tubular capillary column. The weight hourly space velocity (WHSV) value was calculated as a function of the isobutene feed (g h−1), and the weight of catalyst used (g). 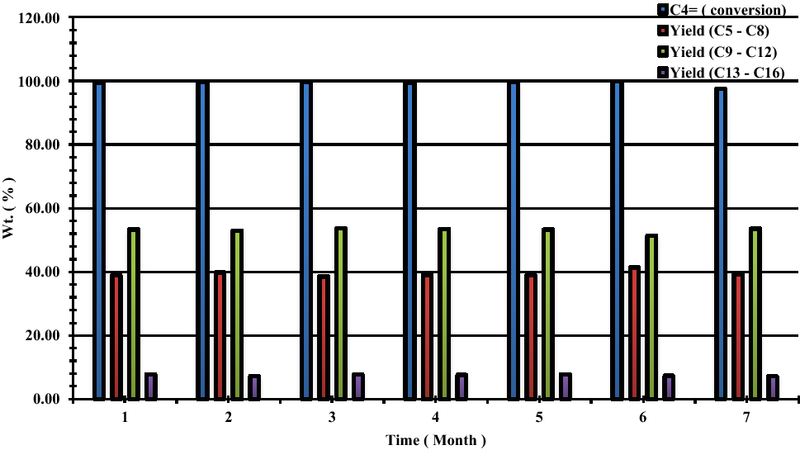 The effect of the addition of diluents in the feed was also studied. 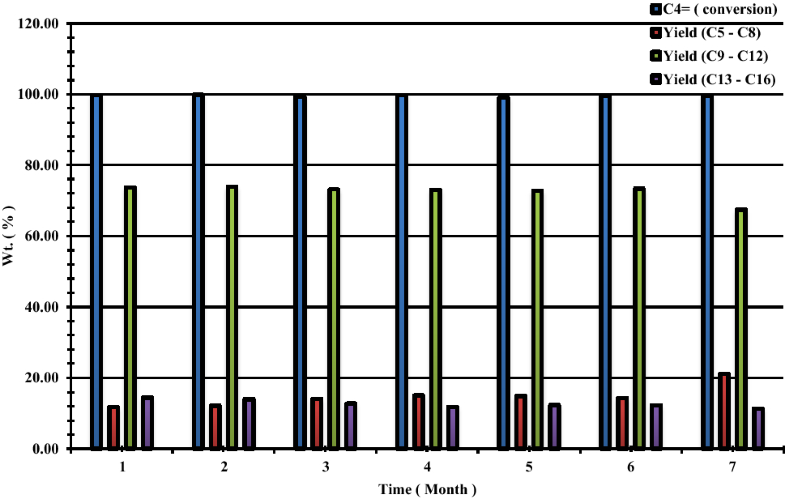 The hydrocarbon total by group type (isoparaffins, olefins and paraffins), research octane number (RON), and Reid vapor pressure (RVP) was calculated using Varian Detailed Hydrocarbon Analysis (DHA) version 5.5 SN 00208. (mass of converted isobutene) (mass of isobutene initially loaded)−1 × 100. (mass of product fraction) (mass of reacted isobutene)−1 × 100. S-tetramers (C 13 = to C 16 = tetramers). The X-ray photoelectron spectroscopy (XPS) technique was applied to investigate the binding energies of the states of element and the possible formation of any new bonds between the phosphoric acid catalyst and support. Three samples were tested (1) H-Zeolite-Y support, (2) supported phosphoric acid on H-Zeolite-Y before heating at 150 °C and (3) supported phosphoric acid on H-Zeolite-Y after heating at 150 °C. The XPS data of wide scan, narrow scan and curve fitting for all the above samples were recorded. All binding energy referred to C1 s = 285.0 eV. Data for the elements, Al 2p1/2, P 2p, Si 2p1/2, and O1 s binding energies are shown in Table 1.
supported phosphoric acid on H-Zeolite-Y after heating at 150 °C. 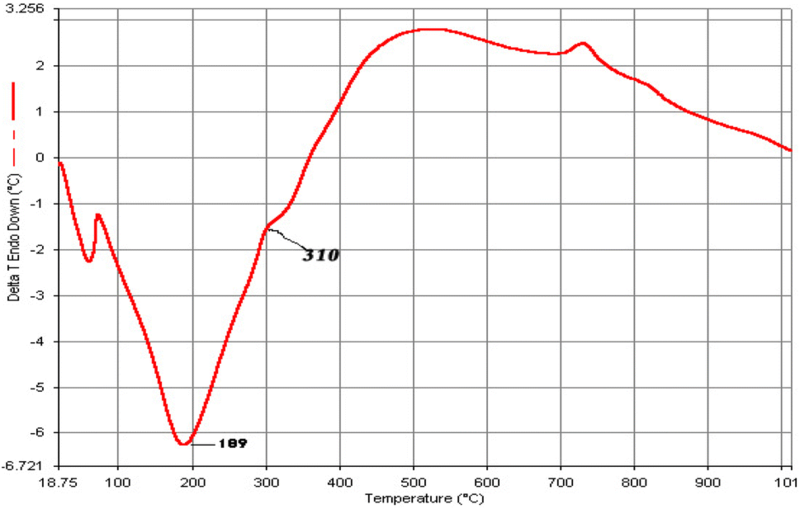 The analysis was performed from 50 °C to 1000 °C in flowing nitrogen atmosphere. Figure 3 shows a DTA thermogram of H-Zeolite-Y support, and Fig. 4 shows a DTA thermogram of phosphoric acid. It can be seen from this figure that the two transition endothermic peaks at 175 °C and 315 °C correspond to the boiling point of the acid and the temperature of decomposition, respectively. Figure 5 shows a DTA thermogram of supported phosphoric acid on H-Zeolite-Y before heating to 150 °C. Two transition endothermic peaks can be seen at 180 °C and 310 °C and a shifting in temperature by 5 degrees, compared with Fig. 3. This is due to a little interaction between the acid and support. Figure 6 shows a DTA thermogram of supported phosphoric acid on H-Zeolite-Y after heating to 150 °C. It can also be noted from Fig. 6 that there is a shift in temperature by 9 °C compared with Fig. 5 and by 14 °C compared with Fig. 3, which reveals that there is a stronger interaction between phosphoric acid and zeolite support. This is also in agreement with XPS results. The shape and the crystal size of supported and unsupported zeolites were determined by scanning electron microscopy (SEM). Figure 7 shows typical SEM images of H-Zeolite-Y and the supported phosphoric acid on H-Zeolite-Y. The SEM images show evidence that impurities are not present, not even amorphous ones. The crystal sizes of supported and unsupported zeolites used in this study were between 0.2 and 0.5 µm. A single crystal of the H-Zeolite-Y zeolite presents hexagonal and orthogonal patterns. Moreover, aggregation of these hexagonal and orthogonal particles occurs due to the high surface Gibbs free energy of the H-Zeolite-Y particles. The crystallinity of the H-Zeolite-Y and supported phosphoric acid catalyst samples was checked by powder XRD. Figure 8 presents the XRD patterns of the samples before and after supporting zeolite with phosphoric acid (before and after heating to 150 °C). The relative crystallinity is determined by comparing the integrated intensities of many characteristic XRD peaks in the 2-theta region of 4–40°. It is shown that the characteristic diffraction peaks assigned to the H-Zeolite-Y zeolite are preserved and that no modification of the crystal phase is observed after supporting zeolite with phosphoric acid. This indicates that the structure of H-Zeolite-Y zeolite is not destroyed by treatment with phosphoric acid. In addition, no broad bottom reflection placed at 2-theta 20–25° corresponding to the possible contribution of amorphous material was observed in three samples. The changes in BET surface area, pore volume and pore size distributions of the unsupported and supported H-Zeolite-Y zeolite samples were determined by N2 adsorption–desorption isotherm technology. 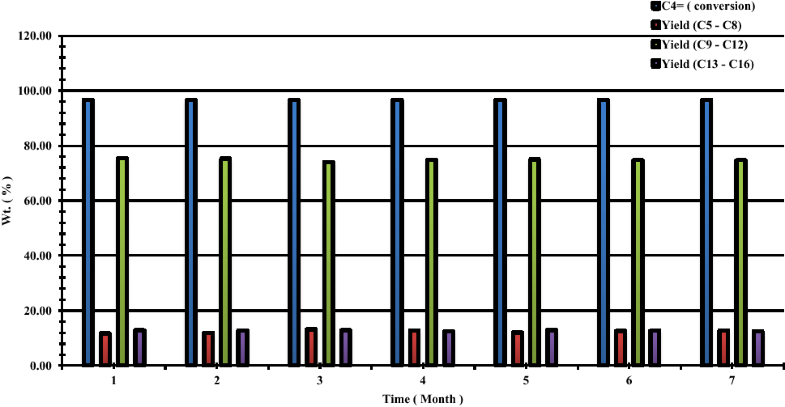 The data are presented in Table 2. A decrease in the BET surface area of unsupported and supported zeolite samples from about 797.622 to 59.1 m2/g, BJH surface area of pores from 205.220 to 19.25 m2/g, BJH volume of pores from 0.2796 to 0.1300 cm2/g and BJH average pore diameter from 54.510 to 270.117 A° was observed. This phenomenon indicates the blockage of the surface area and channels in the H-Zeolite-Y zeolite due to the swelling and deposition of phosphoric acid in the framework of zeolite. 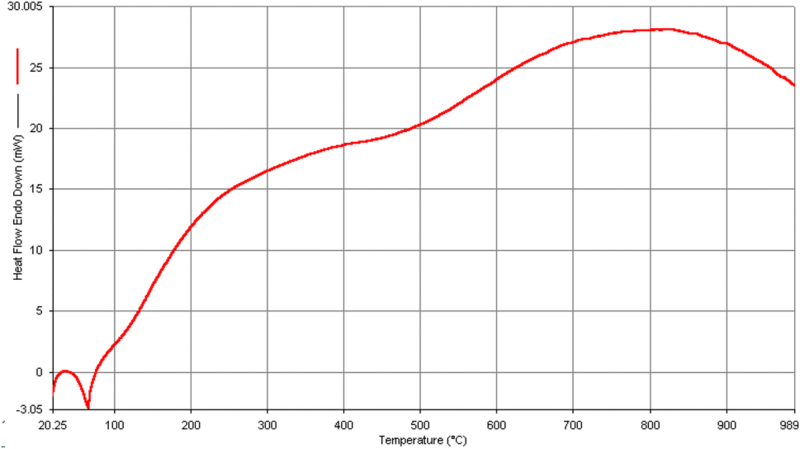 The effect of temperature on isobutene conversion as well as on oligomer distribution has been studied over a range of 50–100 °C. One reason for this is the fact that the oligomerization of isobutene is a very exothermic reaction . The oligomerization of isobutene was carried out at 50 °C, 75 °C and 100 °C, with space velocity of 176.3 h−1, over supported phosphoric acid on H-Zeolite-Y catalyst and under atmospheric pressure. The effect of varying the WHSV has been studied elsewhere , though in this work it remained constant. Under these conditions, the supported phosphoric acid on H-ZSM-Y displayed very high isobutene conversion at these temperature ranges. The conversion of isobutene and the distillate product yield in the range of gasoline, jet fuel and diesel are presented in Fig. 9. Conversion of isobutene slightly decreased from 99.5% to about 93% as the temperature was increased to 100 °C. Isobutene conversions of approximately 99.5%, 97% and 93% were achieved at 50 °C, 75 °C and 100 °C, respectively. The major product of the oligomerization reaction over supported phosphoric acid on H-Zeolite-Y catalyst was C5–C8 fractions. The yield of C5–C8 distillates in the range of gasoline decreased from 48% to 12% as the temperature increased from 50 °C to 100 °C. The maximum yield obtained was about 48% at 50 °C with a space velocity of isobutene 176 h−1 as shown in Fig. 9. Similar trends in the yield of higher distillates of C13 to C16 were obtained under variable temperature. The yield of C13 to C16 fractions in the diesel range increased from 8.0% to 12.0% as the temperature increased from 50 °C to 100 °C as shown in Fig. 9. 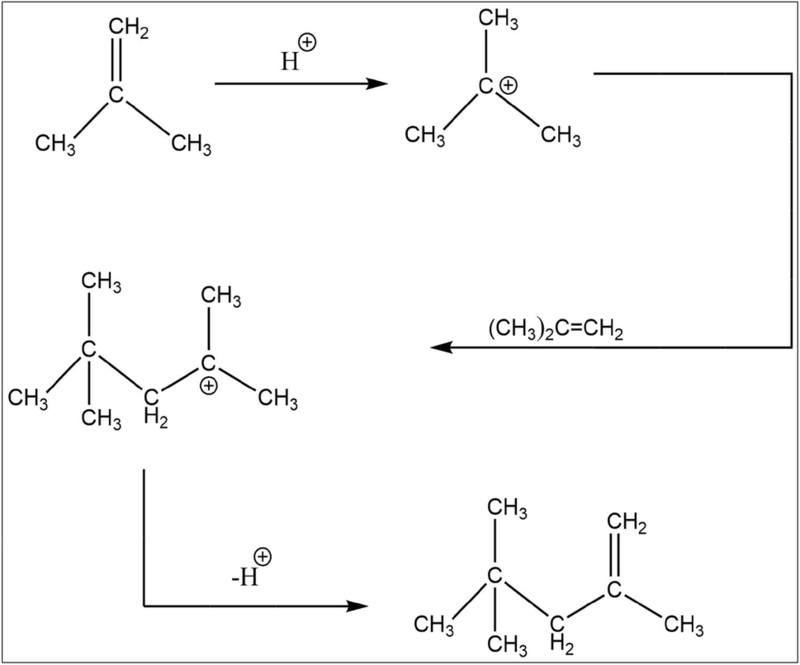 Figure 10 depicts the effect of catalytic activity on the selectivity of gasoline, jet fuel and diesel distillates over supported phosphoric acid on H-Zeolite-Y catalyst at various reaction temperatures. C5–C8 distillates in the range of gasoline were the main products with initial selectivity of 65% at 50 °C. Selectivity of those fractions decreased to about 14% as the temperature increased to 100 °C, while selectivity to C9–C12 distillates in the range of jet fuel increased from 27% to 71% as the temperature increased from 50 °C to 100 °C. On the other hand, the selectivity to C13–C16 distillates in the range of diesel was also found to be strongly dependent on the reaction temperature. The selectivity increased from 7% to 15% with the reaction temperature increasing from 50 °C to 100 °C. The maximum selectivity was 15%, which appeared at 100 °C, when the isobutene conversion was 93%. It is known from the work of Krawietz et al. that the support does not contribute to the catalysis and that the phosphoric acid is the active phase, which is similar for all supported phosphoric acid catalysts at equilibrium. However, both H-ZSM-Y support and phosphoric acid play an important role in determining the accessibility to the active phase. Figure 11 shows that supported phosphoric acid on H-Zeolite-Y gives higher catalytic activity than unsupported H-Zeolite-Y. This may be attributed to the increase in the acidity after the treatment with phosphoric acid. The selectivity of C5–C8 fractions (65%) in the gasoline range over supported phosphoric acid on H-Zeolite-Y catalyst at 50 °C is higher than that on unsupported H-Zeolite-Y at the same temperature, as shown in Fig. 11. This decreased to about 14% as the temperature increased to 100 °C because of the formation of higher distillates, C13 to C16 fractions in the jet fuel range. Consequently, the selectivity of C5–C8 fractions (58%) over unsupported zeolite at 100 °C is still lower than that of supported zeolite at 25 °C. This is due to the fact that oligomerization is an exothermic reaction, and upon raising the temperature, the rate of reaction increases. The selectivity to C5–C8 fractions is higher than that reported in other work, in which low selectivity for the dimer was reported . The conclusion which we can make is that there is better selectivity to C4–C8, C9–C12 and C13–C16 distillates over supported phosphoric acid on zeolite. The dependency of catalytic activity on time-on-stream over supported phosphoric acid on H-Zeolite-Y at variable temperatures of 50 °C, 75 °C and 100 °C is presented in Figs. 12, 13 and 14. The supported phosphoric acid catalyst examined showed virtually identical trends with increasing time-on-stream, in that there was a steady conversion of isobutene and a steady yield of distillates over a period of more than 21 months, at variable temperatures of 50 °C, 75 °C and 100 °C, as shown in the figures below. The highest steady C5–C8 yield in the gasoline range observed was just over 40%, obtained at temperature of 50 °C with increasing time-on-stream, while C9–C12 in the jet fuel range was about 53% and C13–C16 in the diesel range was about 8%. The same trend was observed at a temperature of 75 °C, a steady conversion of 99.8% and a steady yield in the gasoline range of about 21%, in the jet fuel range about 74% and in diesel range about 15%, while 97%, 13%, 75%, 12%, respectively, were obtained at 100 °C. It can be seen from Figs. 12, 13 and 14, for a period of 7 months, that isobutene conversion fell to 97% at 100 °C, and a steady yield of 75% in the jet fuel range was obtained. Supported phosphoric acid on H-Zeolite-Y zeolite by acid impregnation and ultrasonic vibration technique showed very high conversion and activity in the catalytic oligomerization of isobutene in a continuous gas phase. Under optimized conditions, clean fuel distillates in the range of gasoline, jet fuel and diesel, free of sulfur, nitrogen and aromatic compounds, were obtained. Selectivity to gasoline–jet fuel–diesel distillates is much better over supported phosphoric acid on zeolite catalyst than that of unsupported zeolite. 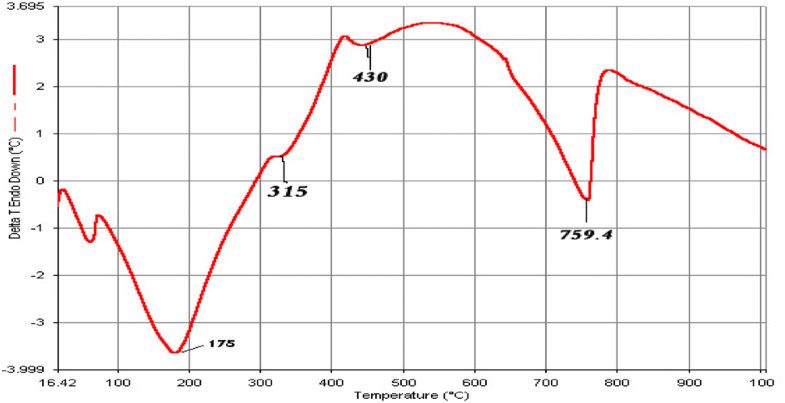 The maximum conversion of isobutene was 100%, the selectivity of C5–C8 distillates 65% in the gasoline range, the selectivity to C13–C16 distillates 15% in the range of diesel, at variable temperatures (50 °C, 75 °C, 100 °C) and under atmospheric pressure. Octane number ranging between 85 and 96 and Reid vapor pressure ranging between 27 and 125 Pa were obtained, with the lifetime of the catalyst being over than 21 months. The authors would like to acknowledge Dr. Turki bin Saud bin Mohammad Al Saud, President of King Abdulaziz City for Science and Technology, for his valuable support and for funding this work at King Abdul Aziz City for Science and Technology. They are also grateful to Mr. Abdul Rahman Alghihab and Mr. Sultan Albishi for their kind assistance in this work.